It appears as though we'll be getting out of the Golden State in the nick of time as the fallout from the likely rejection by voters of most May 19th ballot initiatives is set to make things a whole lot worse for California's budget. The Sacramento Bee reports on the relentless deterioration in the state's finances since the last budget bill was passed a few months back, one that really just forestalled the inevitable. California's projected budget deficit has grown as large as $21.3 billion through next June because of a sharp economic decline, Gov. Arnold Schwarzenegger disclosed Monday in a letter to legislative leaders. The latest projection means lawmakers will have to negotiate deep spending cuts in education, corrections and welfare as well as consider borrowing and new fees or taxes. The announcement comes less than three months after the Legislature and the governor closed $34 billion of a then $40 billion state budget deficit with tax hikes and spending cuts and asked voters to eliminate the rest in next week's special election. These "new" estimates will probably turn out to be just as overly optimistic as every previous forecast and once again, the state of California is blazing a trail for the rest of the country, this time on the road to insolvency. There is more than a little irony in the Gubernator being voted into office some six years ago when his predecessor had similar problems that, in retrospect, look like a walk in the park by comparison, unless of course another housing bubble is in the offing. New plans are being prepared to close the new budget gaps. The governor did not disclose his solutions Monday. But he warned groups last week he will consider borrowing $2 billion from cities and counties, releasing low-level offenders in state prisons and reducing school funding by $3.6 billion. The state also could eliminate its planned $2 billion reserve. "It's well beyond triage," said Senate President Pro Tem Darrell Steinberg, D-Sacramento. "We're talking about painful and difficult decisions. You can't just finesse your way through $15 billion or $21 billion." Here's one way the state might be able to generate new revenue. After having been talked about for some time now, momentum is building to somehow find a way to tax marijuana (presumably, after legalizing it) as reported by the U.K. Guardian. 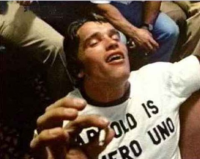 Arnold Schwarzenegger has never apologised for smoking pot – and loving it — at the height of his bodybuilding career in the 1970s. Now, as a struggling Republican governor of California reaching a crossroads in his political career, he might yet become America's most visible advocate for legalising marijuana. The actor-turned-politician gladdened the heart of every joint-roller and dope fiend across the Golden State earlier this week when he said it was time for a full debate on legalisation. Schwarzenegger was careful not to say too much – he stopped short of saying he was in favour of legalising cannabis now – but his words broke a long-standing taboo among both Republicans and Democrats who have previously felt obliged to say marijuana must remain illegal, and marijuana users and pushers be subject to criminal prosecution. The governor spoke in response to a new public opinion poll showing that 56% of registered voters in California favour legalising and taxing marijuana – in part to help the state out of the worst budget crisis in its history. If they ever do such a thing, this California trend is likely to meet with some resistance in many other parts of the country. Legalize it. And I will advertise it. Rooting for yourself to be out in the nick of time, isn't exactly positive, except maybe for you. Problem is other states aren't far behind. I still think we're a couple of years (and some major turnover) away from the legislature making meaningful actual cuts to any programs, or any meaningful attempt to reduce spending. So far, the sum total of governmental response to the ludicrous out-of-control spending in California has been more taxes, fees, and accounting shams, and the current ballot initiatives are no different. You are getting out in a good time, though, as the California government's current financial plan of "shoot us in the head please cause we're drooling brain-dead morons who couldn't extract our heads from our nether regions if our lives depended on it" is probably not going to carry the state for much longer. Why not legalize it? Let the beaten down tobacco companies grow it for the pharmas who can sell it/control it. Maybe the windfall profits Big Pharma would reap could subsidize overpriced pharmaceuticals so necessary for the rest of us. Might even save a few zillions on drug interdiction and law enforcement efforts to nail all those dangerous suburban teenage dealers. Hmmm... let's see. Lower drug costs, less law enforcement budget overruns, happier people... nah! Couldn't possibly work! You know why California is ahead of the rest of the country on insolvency? Because we're the only state dumb enough to depend almost entirely on income and sales taxes for our financing. Other states are allowed to get way more revenue from property taxes. Cut SPENDING period. WTF. When I lose my job and/or stop bringing in as much money (revenue), I CUT SPENDING. WTF. No I'm not a hard right conservative - I'm reasonable. Imagine that. Look for Gov. Arnold to propose a constitutional amendment soon. If you thought "oh yes, make it possible for a non-native born citizen to become president!" you might be mistaken. I think he'll more likely want to amend the constitution to allow states to print money! You'll be leading the way in a wave of people leaving the state. There are LOTS of folks out of a job right now, and the rapidly increasing taxes & fees will drive them out of the state.